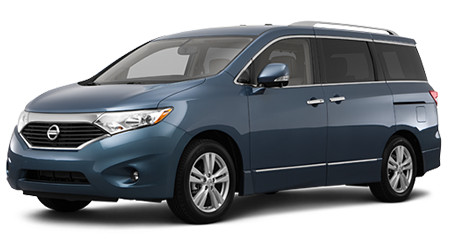 If you’re searching for a spacious and affordable minivan for your family, why not take a look at Nissan’s Quest? The Nissan Quest is a versatile minivan that’s up for any family adventure or road trip. While the new Quest minivan is surprisingly affordable, to make your Quest purchase even more affordable, consider buying a used Nissan Quest. If you live near Spokane Valley and Country Homes, WA, Post Falls and Coeur d'Alene, ID, visit Dave Smith Nissan to view the large selection of used Nissan vehicles, including Nissan’s popular minivan. Every Nissan Quest is equipped with a durable and efficient V6 engine, connected to either an automatic transmission, or with nearly new models, a continuously variable transmission (CVT). You’ll find many standard features on Quest vans, like air conditioning, dual front airbags, power windows and door locks, rear window defroster, tilt steering wheel, and an AM/FM audio system. For additional convenience and comfort features, you can find a used Nissan Quest that’s equipped with remote keyless entry, leather seating, larger diameter alloy wheels, an upgraded audio/speaker system, and a navigation system. You can browse Dave Smith Nissan’s inventory of used Quest minivans anytime, right here on our website. If we don’t have a Quest model available just how you would like it, we can likely find one for you and have it here on our lot in no time. With such a quality selection, you’d never guess that some of our minivans are pre-owned, that is, until you see the low price! Every used Nissan that Dave Smith Nissan sells meets our high standards for quality and reliability, but for even more reassurance, consider purchasing a Certified Pre-Owned (CPO) vehicle. A Certified Pre-Owned Nissan Quest minivan is guaranteed to be less than six model years old and will have under 80,000 miles when offered for sale. In addition, all Certified Pre-Owned Nissan vehicles must pass a rigorous 160-point inspection and a review of its CARFAX Vehicle History Report. Nissan CPO vehicles like the Quest are backed by a 7-year or 100,000-mile limited warranty that covers over 600 vehicle components, including the powertrain. When you’re ready to find your Quest minivan at Dave Smith Nissan, first begin the financing process by visiting the Finance section of our website and completing our short credit application. Even if you have bad credit, our Finance team can still help you qualify for a used car loan for your next vehicle. If you live near Spokane Valley and Country Homes, WA, Post Falls and Coeur d'Alene, ID, and are looking to purchase a used minivan, visit Dave Smith Nissan in Spokane, WA to see the Nissan Quest. Remember: If your car doesn’t say Napoli on it, you paid too much.